The opposition Free Syrian Army (FSA) is creating a special unit of men trained to secure Syria's chemical weapons sites. The opposition Free Syrian Army (FSA) is creating a special unit of men trained to secure Syria's chemical weapons sites, a former general in the country's chemical and biological weapons administration told the Daily Telegraph. “We have a group just to deal with chemical weapons. They are already trained to secure sites,” said Gen Adnan Silou, the most senior ranking member of Bashar al-Assad’s regime to defect and join the FSA. Until 2008, Gen Silou was tasked with drafting emergency response plans should any of Syria’s weapons cache fall out of the government’s control. Working around Damascus and Latakia, he trained thousands of troops in how to secure what analysts believe are the largest chemical weapons stores in the world, consisting principally of sarin, mustard gas and cyanide, according to the daily. “We trained them in securing stores, in reconnaissance of possible threats, in how to purge supplies and in treatment should Syria come under attack a chemical or biological attack,” said Silou. “There were two main stores — warehouse 417 in east Damascus, and another, number 419 in Homs area. We had 1,500 soldiers and two or three generals stationed at each base,” he said. “I know Bashar al-Assad’s character. It is very possible that he will use the chemical weapons against his own people,” said Gen Silou. “They can deploy them from tanks, from rockets, and from helicopters”. Gen Silou decided to join the FSA leadership in Turkey when the government attacked Homs in February. In addition to the barrages of artillery fired from tanks, the attack increased his concern that Assad could deploy chemical weapons in the future. He is convinced that the regime sprayed pesticides from planes on population areas in Rastan, a hub for the rebel Free Syrian Army close to Homs. While the claims cannot be independently confirmed, in February and March patients seen by the Daily Telegraph who had led Rasatn and Homs for Lebanon showed signs of hair loss, skin irritation, chronic muscle pain and sickness. Doctors in Lebanon treating Syrian patients from Rastan and Homs who had fled the country reported seeing unusual symptoms. There are also serious fears that as the security structure in the country unravels these lethal weapons could fall out of government control and into the hands of militia groups, including radical Islamic units. “The weapons used to be to protect Syria. 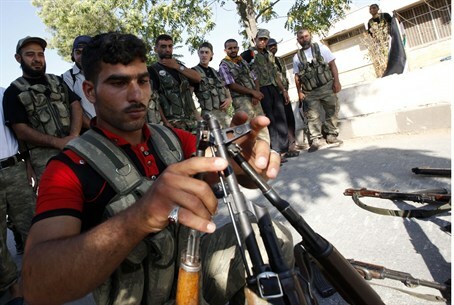 Now they are just to protect Bashar,” said Gen Silou.